Today there is another lie circulating to destroy belief in God: The claim that the biblical accounts are not history, but rather stories borrowed or stolen and then adapted from the made up stories of pagan religions. If there’s no reason to believe the pagan religions, then there’s no reason to believe a made up story based on it either. In part 1 of this article we looked at the veracity of the creation account via the Exodus, since the creation is tied to the Exodus in the fourth commandment. (Ex 20.11) In this article, we’ll look at claims that Jesus rising from the dead is just a motif copied from other religions like the Egyptians – with their belief in Osiris, god of the underworld who supposedly rose from the dead. We’ll see like the lie in the garden, there’s nothing to be gained from this lie, but everything to lose. Is Jesus just Osiris recycled? In part 1, I pointed out that most pagan religions are polytheistic, and thus they must have a story for why one god is selected as the pre-eminent god. In addition to being polytheistic, the stories of Osiris explain (at least in part) other aspects of pagan worship as well, such as why bulls were worshipped, and why the phallic symbol was a required part of the pagan Egyptian worship. I also pointed out that those making such charges have probably never read the pagan accounts. If they had, they would likely think better of making the accusation because there are almost no points of similarity. Let me demonstrate with the story of Osiris. Depending on the version of the story you listen to, Osiris was either a son of the gods become man, or a man become a god. According to the account by Plutarch, Osiris was the son of Keb and Nut, the earth god and sky-goddess respectively. He married the goddess Isis (most stories have Isis as his sister) and together they ruled the land of Egypt, bringing order, and helping with tidbits of wisdom and agriculture, and according to Diodorus, became a benefactor of the whole world by finding which foods were suitable to man. 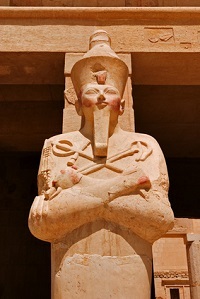 Hatshepsut – one of the rare female pharaohs of Egypt – as the Egyptian god of the dead Osiris. And thus we have associated with Osiris the worship of bulls and the furtherance of one of the symbols of the fertility cults which encouraged immorality among the people and in the temples. In passing pharaohs, upon their death, were mummified to look like Osiris. Depending on who you listen to, this was either as a help in the afterlife – to scare away bad spirits; or because the people believed the pharaoh would become Osiris. Questions that immediately comes to mind are, 1) if the Isralites were copying the Egyptians why don’t they have a story about bull idols being venerated, and how important it is to worship bulls? As it is, the Bible records the calf idols as detestable and worthy of destruction (Ex 32.19-20); and those worshipping them worthy of judgment (Ex 32.35). This is in direct contradiction to the pagan practices and views. And 2) if the early Christians copied Egyptian practices, why is there no tradition of dead Christian rulers being dressed up to look like Jesus – to parallel what Egyptians did with Osiris? Returning to the stories of Osiris, a variation on the story as told by Julius Firmicus Maternus in the fourth century has Osiris and Isis as human siblings with Isis married to Typhon. Typhon killed Osiris when he learned that his wife Isis was secretly in love with her brother Osiris. While the stories of Osiris’ life and death are many and varied, the story of his supposed returning from the dead are few and sketchy. All that is really noted are variations on the theme “…after his death he gained the reward of immorality, and was honored as a god.” And when he did return from the dead, he became Lord of the underworld. Egyptian accounts are unclear about the form he took after death. Spirit only? In a Re-incarnated body (a popular Egyptian belief), In his previous body? Osiris was Lord merely of the hidden, invisible underworld – the place of the dead. Osiris was seen by no one. Egyptians dressed up their kings to look like Osiris at death. There is no parallel practice in Christianity. Clearly the Jesus of the Bible and the Osiris of the Egyptian pantheon of gods have nothing in common, save for the unfounded claims of those, who like the serpent, want to discredit God by propagating the lie that the stories of Jesus are based on stories of Osiris. What about Other Religions? Was Jesus copied from them? Since I want to focus on two key pieces of evidence in this matter, I will not refute his claims directly. Instead, I will provide evidence to show why the Biblical claims are true, and refer you to Sarfati’s article for further detail on why Graves is gravely mistaken in his assertion. By way of analogy, consider: The US Secret Service is responsible for identifying and dealing with counterfeit money. In order to do their job agents don’t learn about every possible variation and permutation of a counterfeit bill; they learn what the genuine article looks like, and what all it’s qualities are, and then search for variations from that truth. In like manner, if you can verify that the accounts of Jesus are the “genuine article” it becomes easy to identify the counterfeit lies. This is why we will spend our time looking at the details of the account of the resurrection – if we can verify it as true, we need not look at every counterfeit. If, by rising from the dead, Jesus proved that he is in fact “the resurrection and the Life” (Jn 11.25) and “the way the truth and the life” (Jn 14.6) through which all must approach God, because “Salvation is found in no one else”(Acts 4.12) then we need look no further for the truth. Thus we turn to a conclusion the gospels force us to draw: the only way Jesus’ tomb could be empty is if he rose from the dead. The evidence leaves us no other options for a viable conclusion. In part 1 of this article I point out the primary reason people claim biblical accounts are copied is so they can dismiss the Biblical claims, and live as if they’re false – as they do with false pagan myths. But if it turns out that there is strong evidence for the Biblical account, such would support the claim that the Biblical account is both a) true, and b) not copied; and therefore c) ignored at your own peril. “From a medical standpoint, the description in John chapter 19 is important because it perfectly coincides with the medical condition that Jesus went through at that time. The massive blood loss that Jesus experienced from the flogging probably led to heart failure. And this would have caused a clear fluid to collect in the membrane around the heart and lungs. So when the spear penetrated Jesus’ side, it probably went through the lung and into the heart. When the spear was pulled out the clear fluid that had gathered around the heart, which would have looked like water, came out. This would have been followed by a large volume of blood from the heart. The account given in John’s gospel shows us it was completely consistent with the medical history. The testimony of multiple physicians who examine the death of Jesus is clear: Jesus died on the cross, the leading cause of death being heart failure (though there were other contributing factors), and the Romans certified that death by plunging a spear through his lungs and heart. Clearly, trying to escape the conclusion that Jesus rose from the dead by claiming he never died on the cross is a fact-denying, foolish non-starter. Medical science unequivocally tells us Jesus died on the cross, there was absolutely no chance that he was not dead. Suggestions he was merely wounded and resuscitated from a weakened state when laid in the tomb are completely without merit. The suggestion is, in fact, laughable. If the body of Jesus was still in the tomb, why are Jewish authorities making up lies to cover the fact that the body is gone? In legal terms, this is called an admission against [their own] interests. If there never was a tomb, (as would be the case if everything were made up) and never was a Jesus missing from it, there is no need for Jewish authorities to pay the guards to lie about what holders of “the story’s a pagan copy” theory claim never happened. Obviously if the body is missing there was a body to begin with. So the Jews of Jesus’ day who are in denial that Jesus rose from the dead, are still affirming that the tomb was, in fact, empty. Furthermore, every doubter and critic after them who try to deny the resurrection by claiming the body was stolen are in fact affirming the fact that the tomb was empty. 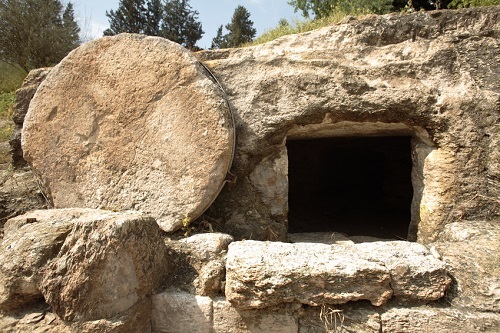 Thus not only does the Bible claim that the tomb was empty, both also the Jews of Jesus day and later critics who claim the body was stolen affirm the fact that Jesus’ tomb was in fact found empty. 2. Who moved the stone? In order to answer the question “who moved the stone” we must first answer : Who had a motive to move the stone? It has been suggested that either the Romans or the Jewish authorities removed the body, and thus had motive to move the stone. But does that make sense of motives? Some posit that the Jews wanted to prevent veneration of the tomb. Unlikely. Since they wanted the tomb sealed and guarded, it is unlikely they wanted to undo all that and move the body – just to do it all over again at another location. As for the Romans, there is no good reason for Roman authorities to move the body. Having finally rid themselves of the riot causing Nazarene, why would Rome, embodied by Pontius Pilate, move the body? At any rate another detail of history makes clear that regardless of motive, neither the Romans nor the Jews removed the body. Because if they had, they had a ready made answer to claims of Jesus’ resurrection. If either of them moved the body, all they had to do to end the disciples claims of a resurrection is produce the body. This would settle the matter for good. The fact that neither the Romans nor the Jews could produce the body is evidence they didn’t have the body, which also means they didn’t move the body. 2) They couldn’t produce or event point to the body to prove the disciples of Jesus wrong. 4) Someone other than a) The Romans and b) the Jews moved the stone. Since if they had moved the stone, surely they would have kept the body and at the very least, know where it was moved to. But they didn’t know. Thus they didn’t move the stone. So neither the Romans nor the Jews moved the stone. Who’s left? What about the disciples? The disciples – according to the stolen body theory – had motive, but there are two practical matters that prevented them. 1) They were too busy hiding from the Jews behind locked doors (John 19.19) to undertake the difficult task of stealing a dead body from a guarded tomb, moving that dead weight around and hiding it – all without being seen, reported and arrested by the guards. 2) They would have had to have taken on (and defeated) armed guards. (In passing it was the temple guards who guarded the tomb, not a Roman guard.) So the disciples cowering behind locked doors “for fear of the Jews ” were in no state of mind to take on and defeat armed guards, and thus could not have stolen the body. The Romans clearly had no interest in moving the body – they just wanted peace after all the commotion. The Priests and Jewish leaders had no interest in moving the body, they wanted it just where it was, in sealed a tomb with an armed guard to keep it there. The suggestion that Joseph of Arimathea moved it runs into the same problems as the disciples: First it makes this righteous and honorable man a liar and a deceiver, and second, he would have had to get past the temple guard as would have the disciples. Grave robbers? Jesus had literally nothing to steal. The guards had already gambled for the clothes off his back (Jn 19.23-24). There was nothing for them to steal. Besides, they too would have had to get past the guards. Additionally as noted in the part 1, Grave robbers don’t care about dead bodies, they’re just there for treasure. The body is worthless to them. If this is all a made up story, Why are Jews making up lies to cover what people already believe to be a myth? And more importantly, who moved the stone? The Romans, Jews, disciples, in fact everyone of the day agree that the stone was moved. The only humans in a position to move the stone (Roman and Jewish authorities) had no reason to move it; and the humans who had reason to move it (the disciples and the women) couldn’t. If, as it is contended by critics and unbelievers, that the biblical accounts are not history, but made up stories based on false pagan religions, there should be no evidence of such stories. Yet biblical critics themselves affirm the very details of the accounts in their attempts to disprove them. To borrow from my illustration in part 1, if you’re trying to claim that the tales of Mighty Mouse are false, you don’t do so by claiming that Mighty Mouse never flew, the people he saved merely believed he flew. That kind of denial affirms both the existence of mighty mouse, and that he acted and saved people – or rather mice; and that those mice believed that he can fly. No, if you’re trying to prove such a story is false, you throw out the whole thing – lock, stock and barrel: There was never a mighty mouse, he never rescued anyone or any creature, and there’s no such thing as a flying mouse. But we never see that type of denial from the people of Jesus’ day. Everyone of Jesus day affirmed Jesus was crucified, died, and the tomb was empty. They could never get away with denying those events because the people of the day were too familiar with what had happened. It would be like someone today trying to deny that jetliners were flown into the World Trade Center on 9/11/01, which subsequently caused them to collapse. Such a denial would never be believed, because everyone today is too familiar with what happened. The fact that the opponents of Jesus – both then and now – affirm parts of the Biblical accounts in their attempts to deny it, proves that there are core truths they cannot deny without being seen through as lying revisionists. This confirmation of the basic outlines of the Biblical account in turn proves that “the stories are copied” theory and the conclusion that “like pagan myths, they’re false”; are just the lies of revisionists who, like the serpent in the garden, will stoop to any level to deny the truth. If you ever wondered what one of the “doctrine of demons” looked like, the claim that the biblical accounts are based on pagan religions, is one of them. For if you believe that Satanic lie and therefore refuse to trust Jesus, the one who truly rose from the dead, you will suffer the same fate as the lying demons. 1. There are a number of different versions of the story of Osiris, each with different details. The story of Osiris as a man is by the fourth century lawyer Julius Firmicus Maternus in his treatise De Errore Profanarum Religionum. Most other versions see Osiris as a son of the gods. 7. I write about a number of the evidences of the validity of the death and resurrection of Jesus in a previous 2 part series called AD Apologetics, here and here. Note his conclusion as to the manner of death matches that of Gilbert R. LaVoie, M.D. I point this out to drive home the point that every attempt to discredit the resurrection by claiming the body was stolen is an affirmation that Jesus existed, was killed, and the tomb found empty. 14. Morison suggests (and I agree) that the priests requests to Pilate for a Roman guard is denied. While the NIV translates Pilate’s response “take a guard”, the Greek records “εχετε” “you have” a guard, in other words, you have your own guard, use them. That they were temple guards is further evidenced by the fact that the guards reported to the chief priests and elders (Matt 28.11), not the Roman authorities when they found Jesus gone. 15. The problem of the women moving the stone is exacerbated if the stone, as has recently been suggested was square in shape – like a cork instead of round and easy to roll. This entry was posted in Apologetics, Bible, Christianity copied?, Crucifixion, Doctrine of Demons, Evidence, Jesus The Messiah, Myths, Pagan Religions, Resurrection, Shroud of Turin and tagged Alexander Metherell, Frank Morison, Jonathan Sarfati, William Lane Craig by Duane Caldwell. Bookmark the permalink.